supplementary E.A.B. (Electric Assist brake System) on the front wheel of the scooter. To stop the scooter completely, just press the fender brake. The CITYBUG2S can also be folded very small whenever you want to carry it or stow it away somewhere – pure, uncompromising compactness with an outstanding design! Press the Start button and off you go. Then just kick-start the Citybug2S with one Foot so the motor will turn over. To speed up, use the thumb throttle with your right hand and rely on your intuition to experience a carefree, enjoyable ride on your new CITYBUG2S. Having reached the desired speed, you can slow down by releasing the throttle and apply the supplementary E.A.B..
For us, safety always comes first. All our CITYBUG2S models are therefore equipped with two braking systems that work independently of each other. Both can be operated intuitively. With the new supplementary “Electric Assist brake System” called E.A.B. you can decelerate your Citybug2S gradually. So you always have full control about the speed. 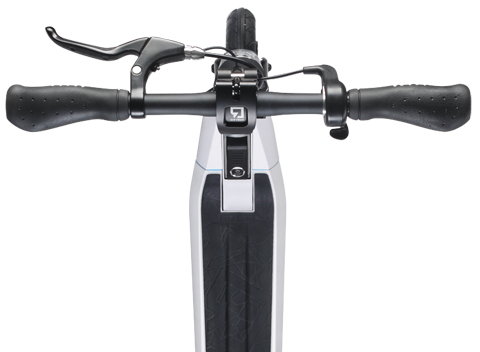 This special brake is located on the front wheel of the scooter and slows down the support of the electric motor. 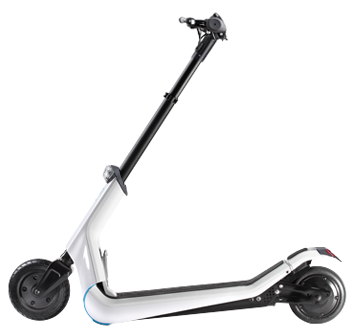 The second method of braking your scooter is the fender brake – a robust rear-wheel brake that you can operate with your foot to immediately bring your CITYBUG2S to a full halt. No emissions – good for your environment! The CITYBUG2S produces no CO2 pollution whatsoever. Combined with green energy from your power supply company, the sophisticated battery technology, which ensures maximum intervals between charging, means that your actual carbon footprint becomes smaller every day. No noise pollution – The CITYBUG2S is a lightweight electric vehicle that moves through the city without generating any noise. Enjoy the feeling of discovering your city on the quiet. Press the Start button and jump on and kick-start your Citybug2S. To accelerate use the smooth and easy going throttle with your right thumb until you reached your wished speed. You then travel at constant speed. To slow down release the throttle and use the supplementary E.A.B. System. Rely on your intuition to experience a carefree, enjoyable ride. Once folded, the CITYBUG2S is smaller than a folding bicycle. It is light enough to carry up several flights of stairs and small enough to take with you on public transportation or even stow under a shopping cart. It is a well-known fact that it is often the little things that make all the difference. You can park your CITYBUG2S anywhere you want, without having to look for a wall or fence to lean it against. All you have to do is release the fold lever and pull on the handlebar until the underside of the footboard comes into contact with the ground. Elegantly parked, your CITYBUG2S then sits there, waiting for your next ride.